Cinnamon rolls are a tried and true favorite, but what happens when you put the cinnamon in the dough and swirl colored sugar throughout? 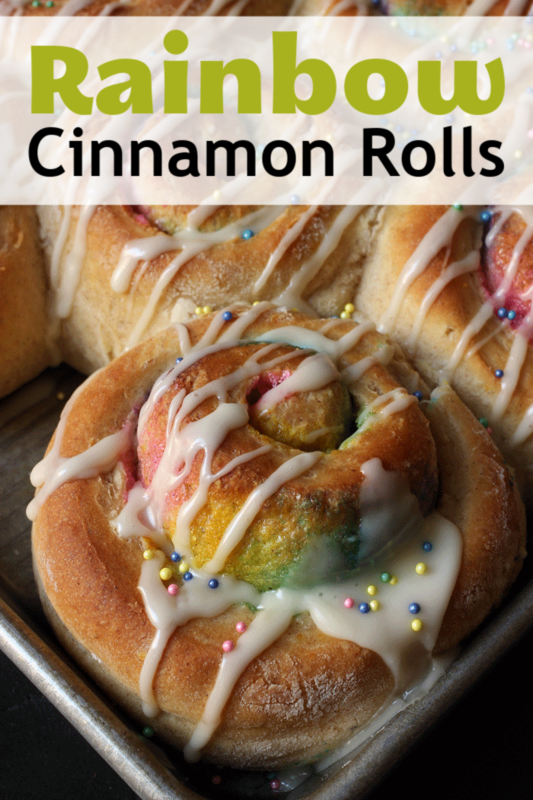 Make these Rainbow Cinnamon Rolls and find out! Everyone loves a cinnamon roll. Light and fluffy pastry, rolled up on butter, sugar, and cinnamon, baked until golden and then drizzled with a powdered sugar glaze. What’s not to love? As good as the classic cinnamon roll is, I love to play with it, changing things up. Whole Grain Cinnamon Roll? Yes, please. Orange Cinnamon Rolls? Sounds great! Maple-Brown Sugar Cinnamon Rolls? Sign me up! Change the grain, change the flavor, change the sugar. It wasn’t a far reach for me to change the color. And the result was a super fun breakfast or dessert treat that would make any mermaid or unicorn proud! As a matter of fact, these would be a fun addition to a budget birthday party that’s got a rainbow theme going! My family loves sweet breads for breakfast. They also love cereal, but seeing as they go through two boxes in a sitting, making my own sweet rolls and breads is a more economical option. They also love donuts. One girl in particular loves them with rainbow sprinkles. But, donuts make me feel guilty. Surely, homemade baking is better than the donut shop, right? 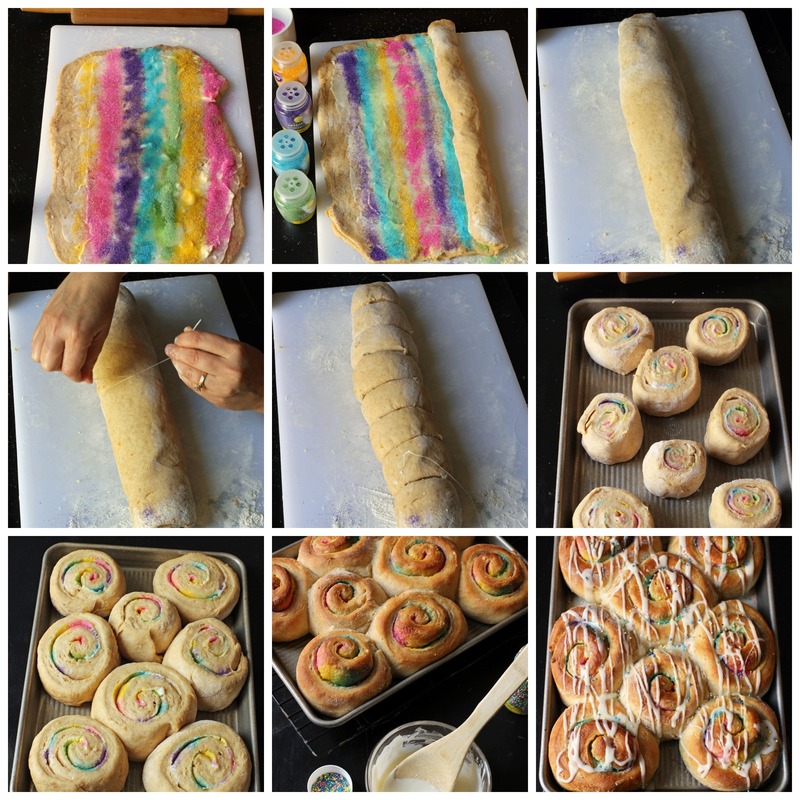 So, enter the Rainbow Cinnamon Roll. These rolls are an adaptation of your typical cinnamon roll. But instead of putting cinnamon in the filling, I worked it into the dough. It tastes just like a cinnamon roll but there isn’t the trademark mahogany stripe. Instead, the stripes are rainbow colored. Yep. I rolled the dough up with butter and colored sugars. The sprinkling sugar colors the dough a bit which is really cool and opens you up to a world of different colors. Bake up a batch of these festive rolls for your next holiday breakfast. You can change the colored sugar to coordinate with the event. Red and green for Christmas, rainbow colored for Saint Patrick’s Day or Easter. Match them to your next baby or bridal shower. The world is your oyster. Or your sweet roll, as they say. After baking drizzle them with a simple powdered sugar glaze and a sprinkle of nonpareils to reinforce the color scheme. Sprinkles make everything better, don’t they? Don’t worry. I adjusted the sugar in the pastry to account for the extra sweetness of the sprinkles, frosting, and sanding sugar. No matter what you do, these are a fantastic breakfast or dessert treat. Are cinnamon rolls breakfast or dessert? Cinnamon rolls are served with breakfast and brunch, as well as an afternoon treat to enjoy with coffee. What goes with cinnamon rolls? Cinnamon rolls are great served with coffee, egg dishes, fresh fruit, and bacon or sausage. Cinnamon rolls are super easy to make. You prepare a sweet dough and roll it out into a rectangle shape. Then you spread softened butter, sugar, and cinnamon over the butter. Next you roll up the rectangle in a spiral. Slice the dough into rounds, place them on a baking sheet, and allow them to rise. Once the dough has doubled in bulk, bake the rolls. Cool them on a rack, and glaze if desired. Yes! You can cool and wrap baked cinnamon rolls and store them in the freezer. Or you can make cinnamon rolls for freezing, allowing yourself some convenience in baking them without resorting to canned sweet rolls. Stock up on ingredients when they are on sale. When I find regular kitchen staples on sale, I buy a lot. I’m currently using a price book to track prices and that’s saving me money. For this recipe, keeping an eye on the price of flour, butter, and sugars can help keep the price down. And of course, stock up on strawberries when they’re at a great price! Buying in bulk – It’s rare that I would buy a small bag of flour. I hedge my bets by buying in bulk. I also have gotten into the habit of buying cases of flour from Bob’s Red Mill or VitaCost so that I always have baking supplies on hand. Load up on post-holiday clearance specials. You’ll find great deals on colored sugars and sprinkles after holidays. Remember that Halloween or 4th of July colors can be used for a variety of occasions. There are lots of ways to use holiday baking items creatively. stand mixer or bread machine – Either of these tools make quick work of making the dough. You can do it by hand, but I prefer my food processor. unflavored dental floss – A must-have for cutting perfectly round cinnamon rolls. Warm the milk in the microwave in a bowl or on the stovetop in a small pot, just until warm. Pour the milk into the bowl of a stand mixer or other large mixing bowl. Stir in the sugar and sprinkle the yeast over the top. Allow this mixture to set for 5 minutes. The yeast should get bubbly. Add the melted butter and eggs and stir to combine. Add the flour, salt, cinnamon, and orange zest. Mix with a dough hook on stir and then on low until a smooth dough forms. The dough can also be stirred and kneaded by hand. Transfer the dough to a greased bowl and cover. Allow to rise until double in bulk, about 90 minute to 2 hours. Move the dough to a lightly floured work surface. Roll the dough into a large rectangle, about 1/4 inch thick. Spread the softened butter over the surface. Sprinkle colored sugars across the dough in ROYGBIV order. To achieve a rainbow effect, spread the sugars in horizontal lines parallel with the long side of the dough. Starting at the long end, roll up the dough tightly. Pinch to seal the edges. Use unflavored dental floss to cut the rolls into eight equal rounds. Place the rounds in a greased baking dish. Allow to rise for another 60 minutes, or until doubled in size. Preheat the oven to 350° and bake the rolls for 20 minutes, or until lightly browned. Cool on wire racks. Meanwhile, in a small mixing bowl, combine the powdered sugar and enough milk to make a thin glaze. Drizzle the glaze over the cooled rolls. Add colored sprinkles if desired. To make it in a bread machine: Combine all dough ingredients in the pan of your bread machine according to the manufacturer’s directions. Set on the dough cycle and start machine. When the machine beeps, remove dough from pan and transfer it to a lightly floured surface. My kids would love these! I’ve never made homemade cinnamon rolls…they intimidate me for some reason, but I’m sure these are better (for you and taste wise!) than the store bought variety. These look soo yummy! I love cinnamon rolls. I believe I could eat the entire pan myself! Just out of curiosity, do you still have the doughnut machine? Cute huh? Try it… I bet your fishbabies will love it! @Emily, those are really cute! (Except for our egg allergy…) not sure how to handle egg dying with my girl. @Jessica, my daughter has recently outgrown her egg allergy and can now tolerate eggs baked into something. Does your daughter have a contact allergy? Mine seemed to have problems only when she ate eggs. So for Easter, we would put gloves on her and let her dye the eggs, but she could not ever eat them. And she still can’t. Of course, I’m not a doctor or know how sensitive your daughter is. But it’s just a thought about what has worked for us, from one mama to another. Gorgeous! I am adding this to my Evernote recipe file, and this will be our Easter breakfast treat. Hello, new family tradition! Well, I found you a possible solution. So you paint them instead of dying them. looks like if the egg allergy person wears gloves they won’t react. Plus the spoon touches the egg and it’s typically the inside folks are allergic to. Let me know if you try any. My friend Nan has an eggless honey wheat bread (or are ya’ll gluten free too). Let me know. If you want it I will pass it along. Lastly – check out Bobs Red Mill if you don’t use his stuff already. He has a whole gluten free line of muffin mixes, etc. and his whole grains are fantastic. I’m sure that all the cinnamom rolls are gone but if you could, I’d love to see what they look like inside before eating. I’ll try to remember to take a picture next time. you mentioned your family likes donuts. You can make them super easy at home!! get a can of refrigerated biscuits, make a hole in the middle. I just pinch and pull a hole. then fry them. easy peasy. Not saying they are healthy by any means, but quick and easy for sure. For glaze, mix milk with powered sugar, dip and enjoy. These are so awesome! Great use for sprinkles! How cool is that?! 🙂 Love the colors! What fun! @claire, yes, they worked well. Freeze them prior to the final rise. Then thaw in the refrigerator overnight before baking. Can I make these on Saturday and bake them on Sunday morning? Is that at all possible? Yes, just stash them in the fridge, wrapped with plastic or a lid. They may rise a lot, so be prepared to see the staypuffed marshmallow man. Did you mean to say in step 3, “Add milk and eggs”? It’s actually add the melted butter and eggs. Thanks for catching the typo!